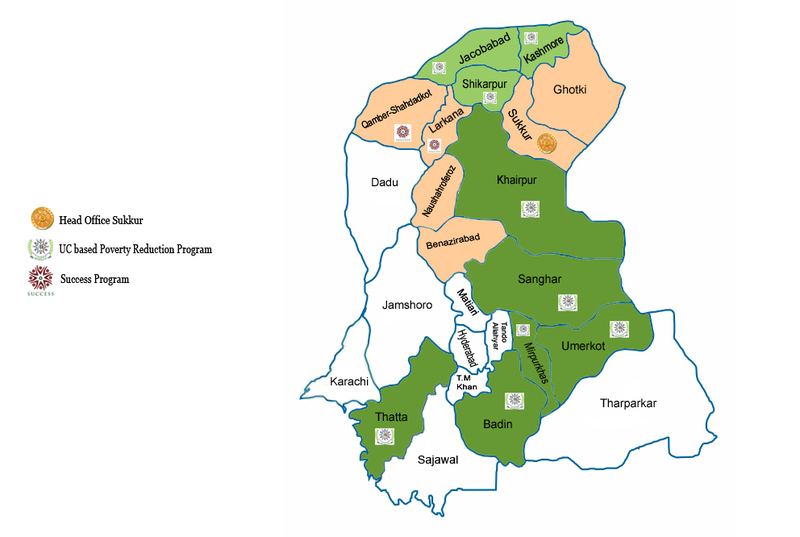 Sindh Rural Support Organization ( SRSO ) covers 90% of the rural Sindh population; working; in 15 district of upper Sindh, i.e. Sukkur, Khairpur, Ghotki, Naushehroferoz, Sh.Banazirabad, Sanghar, Badin, Thatta , Mirpurkhas, Umerkot, Shikarpur, Jacobabad, Larkana, Kashmore-Kandhkot and Qamber-Shahdadkot. SRSO has increased its operations from 15 Union Councils in 2003 to 725 UCs out of total 896 Union Councils of all operational districts until 2019. In 2017 SRSO has increased its operation in six districts of lower Sindh; Sanghar, Badin, Thatta , Mirpurkhas, Umerkot and Sh.Banazirabad . SRSO is currently covering 95 % of rural Union Councils in the SRSO operational area.